We are happy to finally announce that "Godayuse.com" Beta version will come by the end of 2016! Godayuse is world's first day-use portal (Website and Android/iOS Mobile Application) specializing only in day activities, hangouts, leisure per day that does not require traveling or sleeping outside the home or spending only a few hours in cinema, restaurant or shopping mall. We will provide different experiences in each city. You do not have to go out of your city to enjoy your time. You will be able to enjoy the most of the entire services of hotels, parks, spas and many adventurous places for much more affordable and less time! 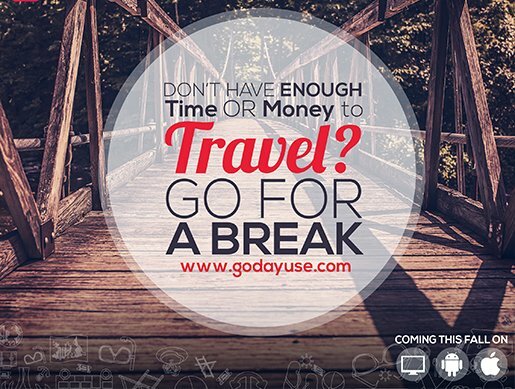 If you don't have enough time or money to travel even for few days, don't want to spend a little time in mall, cinema or restaurant, Godayuse will be the best solution and will let you discover all nearest places to enjoy a full day (day-use) to get out of your daily routine. Stay Tuned and subscribe on Godayuse website to be the first to know when we launch in your country!